Spend long enough in a conversation on war, and eventually someone will unearth an old quote from Gen. Robert H. Barrow, the former commandant of the Marine Corps: “Amateurs talk about tactics, but professionals study logistics.” Supply and resupply is the infrastructure that makes all the rest of war possible. So, in a curious twist, to figure out the logistics of future wars, Local Motors launched a software platform called, appropriately enough, “Launch Forth.” Launch Forth is for amateurs to try their hands at a major logistical puzzle. The Modular Logistics Vehicle (MLV) project will result in the design of a new modular vehicle system that meets a range of logistical missions. 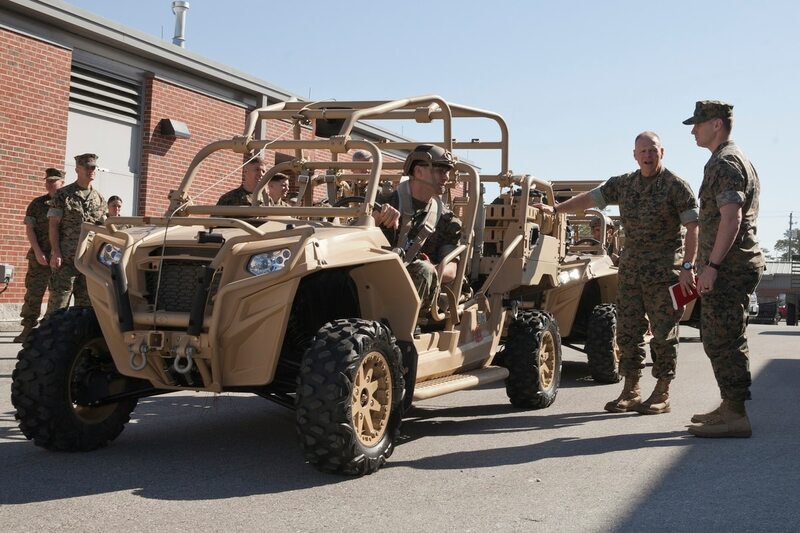 Through concept and technical design, challenge participants will work to design a new vehicle that allows for modular adjustments to improve the Marine experience and their corresponding operations. Use cases could range from personal movement, mechanical repair, construction and administrative support. The competition is in two stages, with a now-closed concept design phase and a technical design phase open until March 25th. There’s prize money involved: $10,000 to be divvied up among seven design challenge winners, and more than $40,000 for technical prize winners. In addition, the Marine Corps will select a winning design April 23rd and then move on to proof-of-concept and prototyping stages. If all this sounds very Silicon Valley, that’s because it is. Launch Forth is San Francisco-based and bills itself as “a SaaS (software as a service) platform for product design powered by a robust community of designers, engineers and solvers.” In essence, it’s a way to crowdsource designs, rather than commissioning them. When people submit their entry in the contest, they do so with the understanding (at least clicked through on the submissions page) that Local Motors gets rights to the winning designs. (Silicon Valley, incidentally, *loves* Barrow’s quote about logistics). The vehicle can be no longer than 11 feet 8 inches, no taller than 6 feet, no wider than 5 feet 4 inches. In addition, at least part of the vehicle must be 3D printed. It can weigh no more than 2,000 pounds empty, and 4,000 pounds fully loaded. And it must have a minimum 10 inch clearance. Beyond all that, the design must contain four distinct modules to accommodate tasks like Personnel Transport (room for six occupants and four bags) or Administration (a solar panel power supply, as well as everything needed to run a computer, a printer, and a label maker, as well as other requirements), as well as specified construction and mechanical support modules needs. All the modularity feeds directly into another major requirement: it should be possible for two marines to change out modules within 15 minutes. If the concept and technical design stages are successful, and the Marine Corps finds the skeleton of a design that can ultimately perform multiple missions in the field, then the exercise will have been a steal: two months of concept design time, $50,000 in total prize money, and a new wealth of designed concepts to tweak and manage in the future. But it’s important to remember that, despite this being a Local Motors project and a vehicle design competition, the partnership isn’t really about building a vehicle. This is really about the Marine Corp contracting with a software company, to then coordinate and reward crowdsourced designs, to get new concepts ready for possible fielding and delivery by someone else down the road. All of this matches a slew of recent Pentagon efforts, from sending a single Marine to adapt an open-source drone design to Marine needs, or the entire reason for the Defense Innovation Unit Experimental. If the Pentagon is to adapt to the pace of technological change, and to field new machines with anything like the rapidity needed, it’s likely that someone needs to figure out a new approach, a new way to go from “here is a problem we have” to “here is the technology that meets that need.” To do that, the Pentagon is increasingly turning to the expertise of amateurs, with technology companies in the Bay Area happy to play the middlemen.